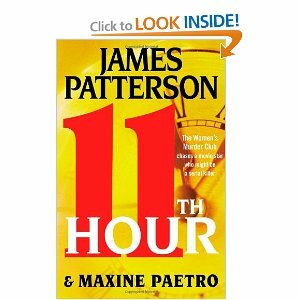 Are you a James Patterson fan like I am? If so, you are going to love this book. I love the Women's Murder Club series. Take a peek at what Lindsay and the girls are up to. Your best friend Lindsay Boxer is pregnant at last! But her work doesn't slow for a second. When millionaire Chaz Smith is mercilessly gunned down, she discovers that the murder weapon is linked to the deaths of four of San Francisco's most untouchable criminals. And it was taken from her own department's evidence locker. Anyone could be the killer--even her closest friends. Or a vicious killer? Lindsay is called next to the most bizarre crime scene she's ever seen: two bodiless heads elaborately displayed in the garden of a world-famous actor. Another head is unearthed in the garden, and Lindsay realizes that the ground could hide hundreds of victims. Hey, this is one of the books they highlighted in last week's Book Report radio show. Sounds like it's going to be another winner from him. I was amazed to hear on the show how many books he's written, that he holds a guiness record for most bestsellers, and has sold more copies than some of the top authors combined! It's worth taking a listen to the archived show on bookreportradio(dot)com. You can also find the list of 7 stations the show airs on and the schedules, though a word of warning...be prepared to start adding books to your list of "books to read"!